Despite the fact they live in the most prosperous nation in the world, thousands of Sioux Elders are suffering from hunger and malnutrition. 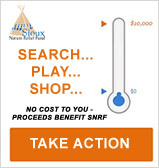 That’s why the Sioux Nation Relief Fund’s (SNRF) Food Program was created. 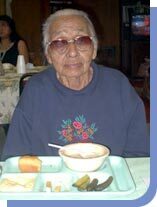 According to the former Indian Health Service Unit Director for South Dakota’s Pine Ridge Hospital, malnutrition is one of the most prevalent illnesses that threaten the health of the Elders of Pine Ridge. The reservation encompasses two of the poorest counties in the entire United States. is likely to be this woman’s only one of the day, she can also take home nutritional supplements. SNRF's Food Program delivers food to the Sioux Elders of the Manderson, Oglala, Pine Ridge, Wakpmani, Allen, Porcupine, and Wamblee communities, along with the Cohen Home (a residential facility for the elderly). A typical food delivery includes items such as soup mix, dehydrated milk, flour, sugar, canned fruits and vegetables, and other similar staple items. In many cases, these Elders depend almost completely on the one meal a day they receive at their local Elder Nutrition Center. 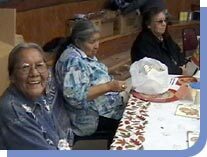 So, in order to address the issue of malnutrition among Sioux Elders, nutritional supplements are added to deliveries and are available for Elders to take to their homes. These supplements help ensure that the Elders have healthy foods to eat at home. The supplies the Elder Nutrition Centers receive from SNRF release additional funds for the centers to purchase items such as fresh fruits, vegetables, and meats. The Food Program is a vital resource because it serves the dual purpose of bolstering the limited food supplies at the Elder Nutrition Centers, and supplementing the food Elders can use at home. The poverty of the Sioux Nation is overwhelming, even to someone who lives there. Just ask Marian One-Star Sorace. A program volunteer for Sioux Nation Relief Fund (SNRF), she remembers being brought to tears by the tragic sight of homeless people around her village. Many of these people were elderly and malnourished as well. But Marian didn’t just sit around and feel sorry about their plight. She decided to take action, and went back to her house, cooked a big meal, and invited all the homeless she could find into her basement for a free, nutritious meal. 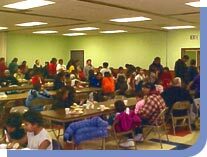 From that humble beginning 12 years ago, Rosebud Soup Kitchen has grown to serving approximately 50 people every Sunday. They all meet in the community’s tribal building for a warm and filling meal, plus a healthy side of companionship. The Sioux Nation Relief Fund supplies Marian with flour, sugar, soup mix, and canned vegetables to serve each week. Volunteers help to prepare and serve the meals and one member of the Rosebud community prepares the traditional Fry Bread to go with the soup. It’s a wonderful opportunity to lessen the feeling of isolation, provide human interaction, and decrease the chances of nutrition-related illnesses. Marian One-Star, along with Sioux Nation Relief Fund, has provided hundreds of hearty, nutritious meals for young and old alike. SNRF also provides the food Marian needs to cooks up those special Rosebud Soup Kitchen meals for Thanksgiving and Christmas, bringing holiday cheer to those who need it most and giving them a reason to celebrate.